Patrick Birmingham, M.D.- Board Certified Orthopaedic Surgeon - Chicago specialist in Hip Arthroscopy, and surgical treatment of Cartilage, Shoulder, Knee, Elbow injuries, & Sports Medicine. Patrick Birmingham, M.D.- Board Certified Orthopaedic Surgeon- Chicago specialist in Hip arthroscopy, sports medicine and arthroscopic surgical treatment of shoulder, knee, and elbow injuries. 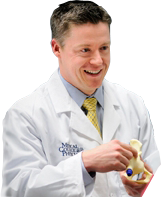 Dr. Birmingham is a clinical faculty for the University Of Chicago Department Of Orthopaedic Surgery. After completion of residency at George Washington University, Dr. Birmingham completed a fellowship in Sports Medicine, Shoulder Surgery, and advanced Hip Arthroscopy at the Hospital for Special Surgery which ranks first in the nation in orthopedics by U.S. News & World Report. Dr. Birmingham serves as a Team Physician for the Chicago Bears, and has served as team physician for the New York Giants, and Milwaukee Mustangs. Dr. Birmingham concentrates on Hip Impingement and Arthroscopy, anterior cruciate ligament (ACL) reconstruction, the treatment of shoulder dislocations and rotator cuff injuries, and cartilage repair.